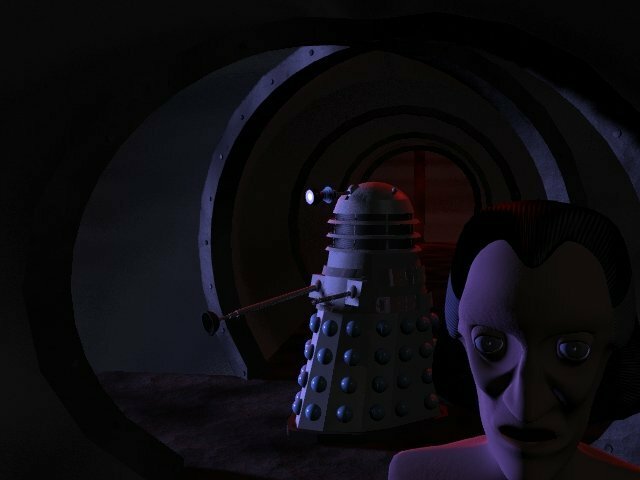 All the posts under this category are directly linked to the involvement of Cliff Bowman, Who3D, BBC Wales, and myself in an attempt in 2002 to create an animated series of Doctor Who. Okay, it’s been several months since my last post, but life got seriously in the way. However, I’ve managed to mostly piece together the names of my co-conspirators on the BBC Project. I may have missed one or two, but maybe by putting up the names I do have, we can worry about filling in any blanks later. So, first and foremost, Cliff Bowman. Seriously, someone give this guy a guest spot or at least a free membership and panel space to talk about the project. Or an interview in Doctor Who Magazine – c’mon, it’s the 50th Anniversary of the show, what better time to tell people about this? Now, I’ve found two names from the BBC itself. Phil Balaam I have mentioned before as our contact in the BBC Wales Research and Development Department, but I also found that Nigel Partridge was involved. I believe Nigel was actually music, judging from the incomplete emails I’ve gone through. Maybe Chris Sutor… not sure on that one. And me, back when my name was still Danny Heap. I also spoke to a chunk of local Australian talent. Hey, if you’ve got contacts, you use them. And I had access to award winning writers, artists, and people who had worked on major Hollywood motion pictures. Apart from Nick, Richard, and Mondy, most of these were generally only one or two conversations to let them know the BBC Project existed, and gauging their willingness to help out. It was pointless to ask them for more given the project could fold at any point. But it gave us access to names that could help the cause and show we had access to a greater pool of talent than just the folks in Who3D. Richard Freeland – Doctor Who fan extraordinaire, he has a solid knowledge of the show, and an excellence sense of story. He made some great story suggestions, and helped come up with the idea of Phoebe as a companion. Ian Mond – Long time friend, he’s the one who first helped me to get a place writing for the Big Finish Short Trips collections. I’m quite fond of Mondy’s writing, but he was also my regular confidante, giving me someone I could talk to about everything that was happening, as we’d get together almost every week. Nick Stathopoulos – Hugo nominated artist. Has also worked on films, TV, computer games. He also did some preliminary design work for us. You can find it in some previous posts. Sean Williams – Multi award winning writer and New York Times bestseller. And big Doctor Who fan, and old mate. Kate Orman & Jonathan Blum – Both of whom have written for the Doctor Who range, and are old mates. Lewis Morley & Marilyn Pride – Yet more old mates (Australian science fiction fandom has been very good to me, in terms of friends and potential contacts), Lewis and Marilyn have worked on a range of very high profile films including Superman Returns, Mission Impossible 3, the Matrix series, and the Star Wars prequels. Some of these folks may remember me talking to them, some may not – it was one or two conversations held a decade ago, remember. I also had, through these and other friends, the ability to contact a range of other high profile talent. But naturally I wasn’t going to even think about pursuing those folks unless things actually got to the point where the series would be made. Basically if we had gotten to the pilot stage, I was going to be able to at least offer to contact some major genre names from the US and UK as potential writers for the series to make the idea of going ahead a much more attractive prospect – people like names. 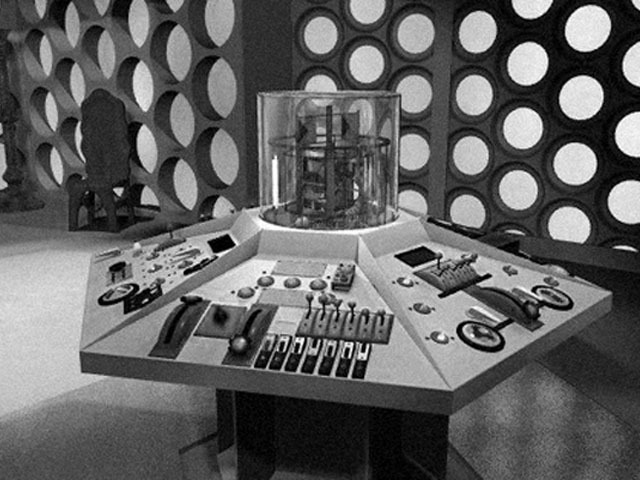 My Hartnell TARDIS console room, rendered up, made grainy, and black and white. This was amongst the stuff we sent to Phil Balaam. For previous parts in this series, go here. Nothing majorly relevant to the project here. This is just a brief general rundown of a couple of things whizzing about in my head. As you can see if you’ve read Part 2 of the bible, I favoured a very traditional approach to the basic series format. After Russell T. Davies’ first season came out and was resoundingly fast and modern, I thought that yeah, I was so wrong. Looking through some of the emails last night, just goes to show that I’m glad I kept them because looks like I’d heard a rumour that the Doctor Who series was being produced a few days before it was announced. I had completely forgotten about this. Found an email from Cliff referring to it and him being surprised I hadn’t said anything to him, with me replying that I wanted to wait until I heard something more concrete before mentioning it. There had been so many, “Doctor Who is coming back!” rumours that had never panned out, and even though this came from a fabulous source, I’d always rather be cautious. Plus, from what I’d heard, formal announcement wasn’t going to be until Jan 2004, so there was meant to be plenty of time. Obviously it got pushed forward, probably because the BBC knew otherwise it would get leaked and they wanted to make sure they controlled the release. I mean hell, I’d heard about it! The thing that surprises me is this was in late September of 2003, and we weren’t killed off until November, and even then, the main reason seems to have been the previously mentioned budget stuff that killed the BBC Wales R&D Department. I’m surprised it took that long, and that we were collateral damage rather than an actual target. Not that I think we were all big and important, but that I would have thought anyone developing something that could potentially damage the new brand would have been dealt with immediately. Then again, it’s a bureaucracy. We had a drama meeting in October 2003 to decide whether or not we’d go ahead. I was thinking that, as I go through emails, I’ll go back and re-edit posts where appropriate to correct errors and omissions. Would people prefer that, or would you rather I left the original inaccurate text and instead added footnotes and/or an errata sheet at the end of all this? Let me know. You will be able to find all the posts on this topic here. Anyway, here is part 2 of the bible. In this bit I discussed the possible formats, weighing up the pros and cons. 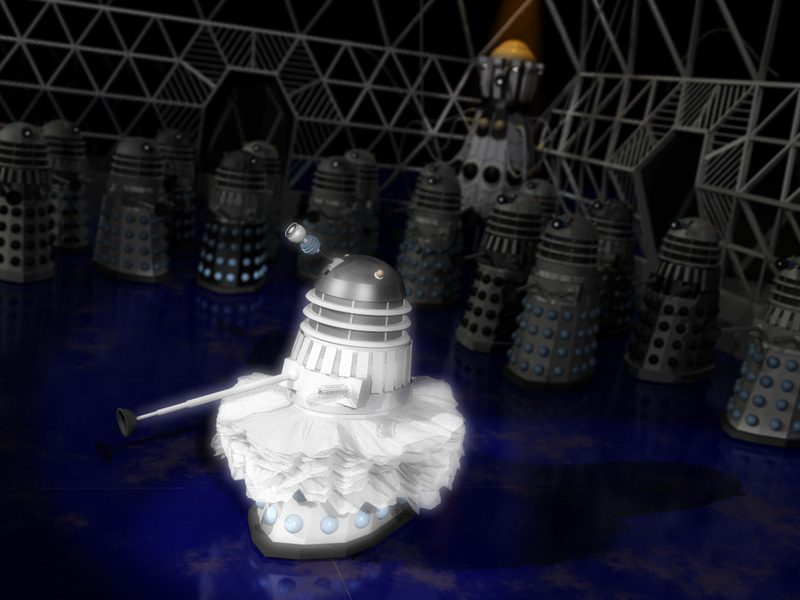 A single frame of a test animation I did to show how such a shot might look. 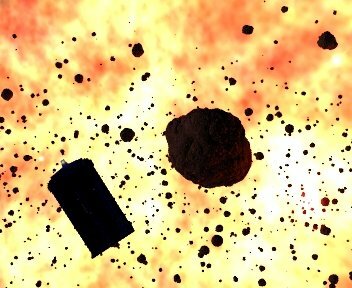 The background is a nebula. Continuing on from the initial post I present the first bit of the Doctor Who animated series bible for BBC Wales R&D Department. I’ll split this stuff up over a number of posts because there is rather a lot of it. As with yesterday, I won’t be re-editing it, so the grammar and spelling errors are all from the original document. This first bit is the general introduction and character outline. I finished the whole bible on 19th January, 2003. Phil Balaam was pretty happy with it and the rest of the work the team gave him – sketches and renders all showing that we were serious about the work. The reason I haven’t named some of the other members of the team so far is that I need to check back through my emails – basically I don’t want to miss anyone out. I will hopefully provide a full list in the next few days, then go back and edit the first post to add them in. I was a bit upset yesterday to discover that the copies of the incoming emails on this PC have become corrupted. However I have other copies of the directory burnt to at least a couple of CDs, because natually I never wanted to lose this stuff, so hopefully I should still have all that correspondence. Plus, I do still have all my outgoing emails, complete with quoted text of what I was replying to. So worst case, I’ve got half the info, but I should have it all, it’s just a matter of finding it. Today, I reached a decision. I want Cliff Bowman to be recognised by Doctor Who fandom for the part he played in a largely unwritten bit of DW history – The 3D animated series of Doctor Who. I was also a part of this, as were several other folks, but Cliff was at the centre of it. None of us would have had the opportunity to work on it without him, it will always be one of the high points of my life, and I think he deserves the recognition. Ideally, I’d like to him be made a guest at a major DW event next year. I think it’s fitting. The push starts here. He, at the time of writing, knows nothing about it. Please help get the word out. 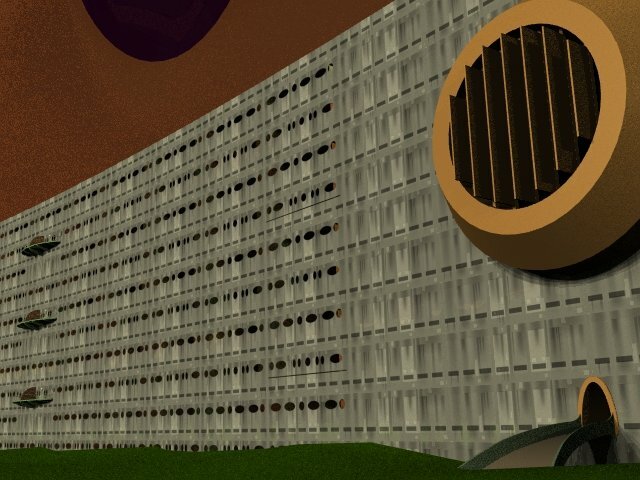 If I get a good response, I will slowly post up other things I contributed to the project. If I get permission from some of the other contributors, I’ll put up their stuff too. I won’t claim that the dates and such below are completely 100% accurate, as I’m having to work partially from memory and I may have one or two things in the wrong order, but it’s essentially right.